I took a spin to our local market, and got to sport my new helmet! Thanks to our mechanic, we have a new headlight, and two new rear view mirrors. All these safety precautions give me much confidence on the scooter. 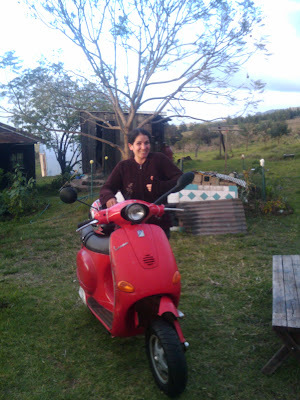 I was a bit nervous to ride, even though it wasn't the scooter I was on when I crashed, but all that went away when I felt the familiar feeling of driving around Kula in the warm spring air. I want to commit to not only wearing my helmet at all times, but covering up no matter how warm it is outside. Shoes, pants, and a jacket will be mandatory! I am motivated to stick with this plan! Soon I am going to go shopping for by new bicycle helmet. I have not ridden the bicycle yet, and I am itching to do so. Once I get my helmet, I plan to start riding around the parking lot of the community center just down our driveway to practice. I am reminded of how I learned to ride my bike in elementary school, in the parking lot of my dad's business at the time, Benchmark. I would go to work with my dad on weekends, and after I was done playing with office supplies, and pretending I was working, I would get on my bike, and ride all over the parking lot. This will be a good way to get familiar with riding again, and then I'll get back out on the road. Last Thursday I finally reached my goal of 31 millimeters of open mouth! I am shooting for 35mm this Thursday. This is the maximum of opening Dr. Clarke wants for me. I am eating, and continue to get better at biting into things with my temporaries, and the new method of bitting with my bottom teeth. I continue to get stronger and have kept off the extra weight I was carrying around. Jump roping, and running have also started to play a small part in my routine. Feeing great these days, and I look forward to every moment with a happy heart.